Congratulations! Impending parenthood is such a joy. 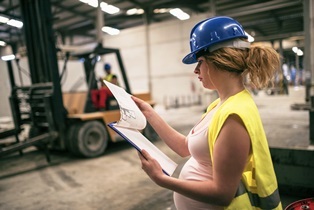 Whether this is your first baby or you’re an experienced mother, if you're on workers’ comp when you become pregnant, you may be worried about how your pregnancy could affect your benefits. We’ll look at a few scenarios but, generally, you should have nothing to worry about. Pregnancy is a natural condition, not a disease or disability. However, it’s possible your doctor will order you to alter your work tasks or even to go on bed rest at some point to aid your and the baby's health. You'll have to follow the guidelines of your employer for those job-related adjustments. Remember that while your employer is prohibited from discriminating against you because of your pregnancy, your condition isn't a work-related illness or injury. Therefore, you can't apply for workers’ compensation benefits if you're unable to do your job because of it. A question I get a lot is whether someone collecting benefits will lose them if they become pregnant. The answer is no; you won't lose benefits. However, any medical care benefits you're receiving for a work injury won't be extended to include prenatal care or delivery, and you won't be entitled to additional benefits because of the pregnancy. If you're collecting temporary total (TT) disability, pregnancy shouldn't affect your benefits if your work injury alone prohibits you from working. If you're on permanent total disability (PTD), the pregnancy will have no bearing on your benefits and your eligibility to continue collecting them. If your pregnancy is making your original work injury worse or delaying your recovery and return to work, you may have a legitimate claim to extend your benefits, but you'll probably need the help of a workers’ comp attorney to make this claim. Employers are often unsympathetic to this situation. Let your workers’ comp doctor know about the pregnancy immediately, so it's included in your medical record. If you're on TT or PTD and were told by an employer that your pregnancy could affect your benefits, call my office right away to discuss your case. If you have other questions about a work-related injury and pregnancy, we're happy to hear your story. This should be a pleasant experience for you, not a time of additional worry and stress. Contact my office today for help. At the least, I hope we can help ease your mind.